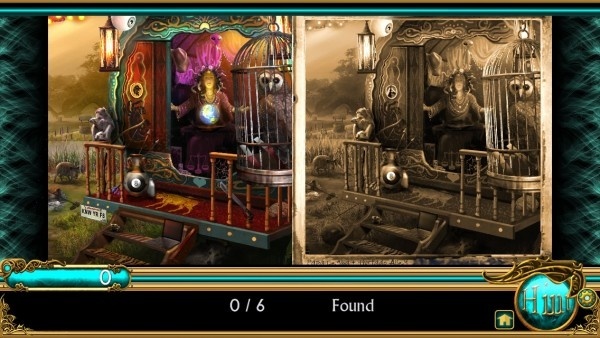 It's a little stingy on game time, but Dark Manor is a satisfying Free to Play Hidden Object game from Big Fish Games. There's a gradual and steady trend for Hidden Object games to embrace the Free to Play model in recent times. It makes sense, too, given that they're the kind of game that's most likely to be played in short yet highly focused sessions. Dark Manor is the latest in this emerging genre to try its luck, and it comes from a major name in the casual market: Big Fish Games. It's quite fun, too, although predictably tight with the game time. With a distinctly ghostly theme that makes perfect sense for regular Big Fish Games players, Dark Manor combines Hidden Object searching and town building style mechanics. The player, having inherited a ghostly mansion in the 1920s, must rebuild the estate while also uncovering some sinister mysteries. What this means is that one will be placing new buildings and objects, nearly as frequently as they will be searching out a random list of items. I didn't find the rebuilding of the mansion overly interesting, but I did appreciate the object hunting. Dark Manor keeps to what works for the genre with each scene offering a plentiful list of supplies that must be sought, and the threat of a fog descending briefly on those who try to "cheat" the system by tapping randomly. Fortunately, hints are pretty generous so players won't get stuck for long. There's no build up play, so to speak, so the item lists are long from the start. In some cluttered landscapes, it can take a little while to seek out such objects, but that's really to the benefit of the player. Limited energy dictates how many times one can play a scene, before waiting for it to regenerate, putting a stop to any significantly long gaming sessions. 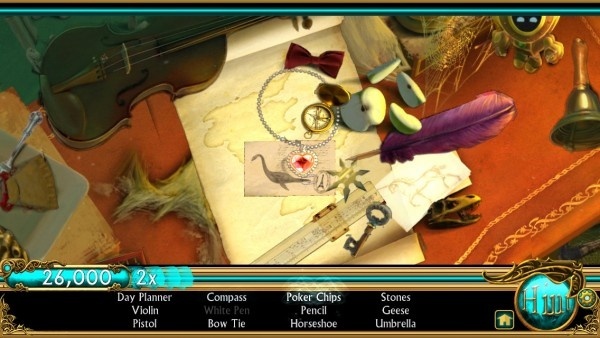 Other familiar moments such as Spot the Difference puzzles, Blitz modes in which players must find as many items as possible, as well as finding a number of similar objects, also play a role and mix things up. Levelling up and a progression system of new chapters further enhance the experience, although don't expect to rush through it by any means. At least, not unless spending real money is appealing. Rarely a genre with exceptional graphics, Dark Manor offers a trump card in the form of "Hi-Depth" scenes, enabling players to see around certain parts of the scenery, adding a kind of 3D effect. It's a nice touch and boosts the stylistic qualities of the game. From my time enjoying Hidden Object games and, less so, town building sims, it's clear to see that such genres are quite divisive. Dark Manor won't convert naysayers by any means, but it will entertain the audience in which it's intended for. I wish energy was more quickly replenished, giving players longer gaming sessions, but it's still quite a fun game to delve into, as well as significantly cheaper than other Hidden Object titles.